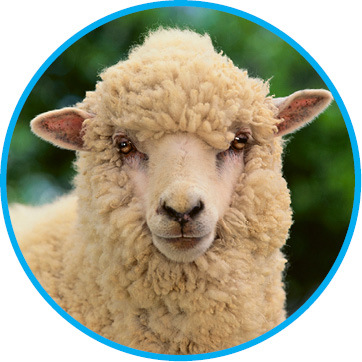 This fact sheet describes the process and benefits to sheep and man from shearing sheep in a safe and professional manner. Domesticated sheep have been shorn since the dawn of civilization. Early on, wool was a vital resource to support human life. To protect this resource, shepherds tend flocks of sheep with care and respect for the animals. Sheep are provided fresh food and water, and protected from disease and predation. Most sheep grow wool continuously and they should be shorn annually. The shearing process is not painful to the sheep. Wool removed from a single sheep is called a fleece. Fleeces are washed and the wool grease (lanolin) is extracted and used in lotions. Clean wool fibers most often are made into clothing or blankets. The lanolin is used in hand lotions.